One of the most common presenting problems in foot and ankle practices is hallux limitus/rigidus. While destructive procedures were favored in the past to treat this condition, it is now becoming increasingly common to use reconstructive procedures. Accordingly, let us take a closer look at some of the emerging advances in the treatment of great toe arthritis. The typical patient presenting to my office with such a problem is a middle-aged man or woman who is active and has developed pain and limited range of motion of the great toe. I try not to use grading systems in such cases because I think it limits my ability to think of each individual and his or her common needs. Instead, I prefer to break patients out according to lifestyle, gender and the amount of arthritic changes. To begin with, the level of arthritis is the most concerning and pressing issue. If the level of arthritis is low, joint destruction is not necessary whereas severe arthritis cases require joint replacement or fusion as a common type of surgery. It may be deceiving to consider a fusion as the only option if there is limited motion as large spurs can limit motion without severe joint destruction. The general point to remember is the longer the time with pain and symptoms, the greater the chance of increased joint arthritis. Women require a greater range of motion than men. Most women prefer to be able to wear heels while this is not a common concern in men. Finally, be careful to find out what activity a patient prefers. A man may do yoga and require motion of the great toe, which will not do well with a fusion if avoidable. A woman may love to dance on her tiptoes and cannot do this with a fusion. Conversely, a woman may like to run trails and be very harsh on her feet. This patient may require a fusion to avoid breakdown and further surgery. After making the decision for surgery, appropriate adjunct testing is required. Use standard radiographs to check the level of joint destruction, the amount of joint space narrowing and the spur locations and size. If there is concern of sesamoid damage and signs of arthritis of the sesamoid complex are present, I have begun to get a magnetic resonance image (MRI) of the forefoot to check the sesamoid complex for arthritic changes and damage to the articular surface of the plantar metatarsal complex. 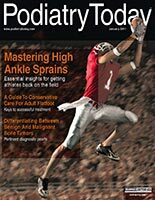 This is essential in simple spur removal cases or reconstructive cases as increased range of motion may result in greater pain in the arthritic sesamoid complex, which is now moving but did not move before. By getting a MRI, I allow the patient to consider destructive procedures from the start versus knowing the potential for sesamoid pain in reconstructive cases involving sesamoid arthritis. What You Should Know About Conservative Treatment Conservative care of great toe arthritis has a solid place in patient care. However, it is essential to consider warning the patient that even the best conservative care will still result in continued destruction of the joint, which may require more advanced and sometimes more destructive procedures in the future. Although I am a fan of conservative care, at times I will try to make the patient understand that short-term pain relief from a conservative option may not be the best long-term answer. My best conservative option recently has been a rocker bottom, stiff soled shoe. With the increase in rocker bottom style tennis shoes from several companies, this has become a “cool” option among patients. When it comes to women’s dress shoes, I prefer that patients use a wedge stiff soled shoe that will not allow forefoot motion. For men’s dress shoes, I prefer a very stiff soled leather shoe and shy away from rubber soles. In general, a tennis or basketball shoe is stiffer than a running shoe. Orthotics also offer a great option to treat hallux limitus. I prefer to make a moderately stiff orthotic and carry the plastic piece of the orthotic in the form of a Morton’s extension to the tip of the great toe. I then cover this with a soft material. This limits motion of the great toe and stiffens the sole of the shoe. Injection therapy is limited in the great toe joint but in certain cases, joint lubrication and viscosupplementation is a good short-term, non-surgical option. A Closer Look At Surgical Options Surgical treatment has generally consisted of: spur removal or cheilectomy; metatarsal or phalangeal osteotomy for realignment and/or shortening; joint replacement; or fusion. I have found that these options are surgeon and patient dependent. In my hands, I find that cheilectomy is an excellent option for early to moderate cases of hallux limitus/rigidus. It is important to remember to be aggressive. In many cases, a cheilectomy may fail due to insufficient bone removal from the dorsum of the great toe phalanx base and metatarsal head. I rarely will perform an osteotomy of the phalanx or ray, and find these procedures to be short-term fixes with the potential for transfer pain to other metatarsals. I still find fusion of the first metatarsophalangeal joint (MPJ) the gold standard in pain control. I utilize this procedure extensively in men who have moderate to severe arthritis, do not go on their tiptoes and wear regular men’s shoes. The most difficult cases are young women who wish to avoid fusion procedures and cases of mild to moderate arthritis that may not require a fusion as the ultimate procedure. In such cases, I have begun to use resurfacing procedures as an excellent option. Finally, if the level of great toe arthritis is mild but there is hypermobility and an elevated first ray, I utilize a first metatarsocuneiform fusion and cheilectomy combination to clean up the joint and realign the first ray. Key Insights On Resurfacing Procedures When it comes to resurfacing procedure options, I divide them into autograft, allograft and metal options. Each has positives and negatives. I have found it necessary to have all three options in my bag of tricks to be able to treat the different cases. Make sure to consider the patient, the level of arthritis, activity type and shoe styles as a whole prior to selecting the type of procedure. Pick procedures that you are comfortable doing but make sure you have a wide array to offer. Think long term and offer patients who may prefer short-term motion that option as long as they realize they may require further surgery in the future. New materials offer a wider array of options and resurfacing potentials. I believe that with proper selection, patient satisfaction with their treatment options related to hallux limitus/rigidus is very high and outcomes are reliable and reproducible by the physician. Dr. Baravarian is an Assistant Clinical Professor at the UCLA School of Medicine. He is the Chief of Foot and Ankle Surgery at the Santa Monica UCLA Medical Center and Orthopedic Hospital, and is the Director of the University Foot and Ankle Institute in Los Angeles .